At the core of the MOREAL reporting system lies an automatic query maker accessible via an easy interface under the Report Types screen, where various simple or more sophisticated charts can be created. 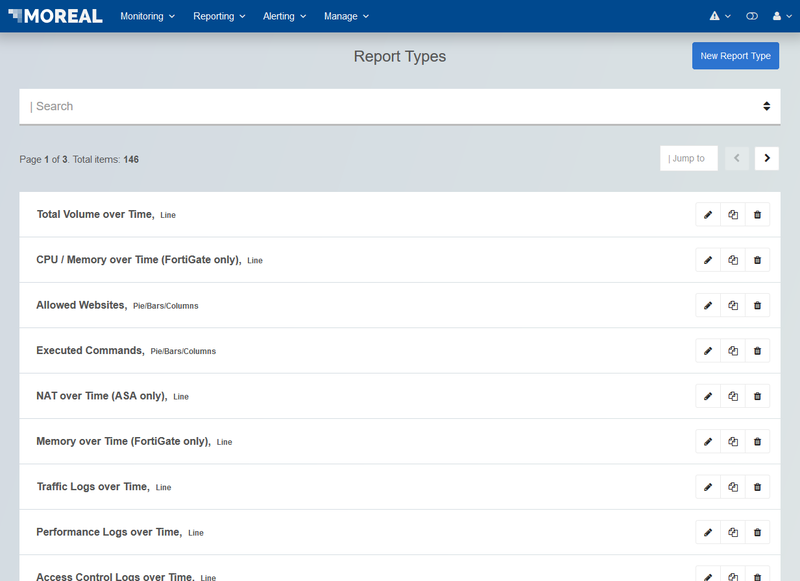 In this screen, the user is provided with a list with all predefined and stored report types, as well as an option for creating new Report Types. The user is able to edit or delete each listed report type by using the action button in each list item. You can edit or remove a Report Type by using the action buttons located on the far right of each row in the table list as shown above. For your convenience, tooltips appear when hovering over the buttons with your mouse cursor. Keep in mind that the Report Types that have been predefined by MOREAL cannot be edited or deleted. To create a new Report Type, click on the New Report Type button on the top right of the screen. The creation procedure is described in detail in the following section.